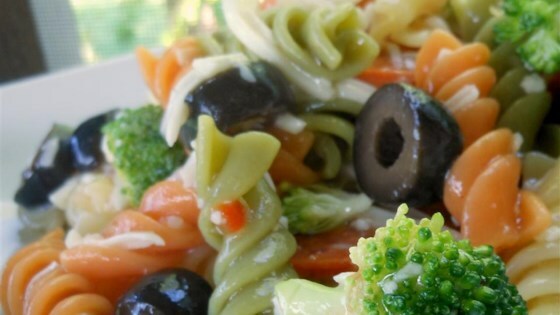 "A terrific Italian-flavored pasta salad with broccoli, pepperoni and cheese." Bring a large pot of lightly salted water to a boil. Add pasta and cook for 8 to 10 minutes or until al dente; drain and rinse twice in cold water. In a large bowl, combine cooked pasta, pepperoni, broccoli, olives, cheese and dressing. This salad combines meat, cheese, veggies, and pasta into a picnic delight. AWESOME AS IS RECIPE! I am picky about pasta salad and THIS WAS VERY GOOD! Since the original recipe, I too have played with it, added other veggies, and it ALWAYS COMES OUT GREAT!